At a luncheon on January 17, The Alliance Accelerations 2018 Sales Contest Winners were announced. Attending were members of all Insurance Alliance Network agencies, as well as Tony Longo and Eddie Aguila of Selective Insurance, the contest’s platinum sponsor. Kenneth Serfass of Miers Insurance received both the Next Generation Award and Producer of the Year Award, and also won the drawing for the Grand Prize. Jessica McMullen of PDM Insurance won this year’s Diversification Award. Miers Insurance was honored as the 2018 Commercial Lines Agency of the Year. PDM Insurance uses this video that combines stunning visual imagery with agency information at trade shows and public events to catch the eye of attendees, and introduce themselves as a farm-focused agency that can do so much more. Ryan Rispoli of HMK is the November winner in the 2018 Accelerations Sales Contest! In second was Todd Collins, also from HMK, and in third was Ryan Koppenheffer of Harding-Yost. Continuing to lead the Producer of the Year portion is Ryan Rispoli from HMK, with Kenny Serfass from Miers Insurance staying ahead of Ryan Amey, also from Miers Insurance, for the second and third spots. In the Next Generation Award category, Kenny Serfass from Miers Insurance remains in first place with Jamie Myers of Christian-Baker in second and Peter Stoll, III of the Stoll Agency stays in third. Jess McMullen of PDM remains ahead of Paul Sheaffer of the Paul I. Sheaffer Agency for the first place and second places with Ryan Rispoli of HMK moving into third in the Diversification category. Miers continues to stay in the number one spot ahead of Sheaffer who remains in second and HMK stays in third in the Commercial Agency of the Year race. For Personal Agency of the Year, Christian-Baker moves ahead of Zinn Insurance for the first and second spots and AIA remains in third. Congratulations to Kenny Serfass of Miers Insurance for being the October winner! In second was Ryan Koppenheffer of Harding-Yost and in third was Alan Goodrich of HMK. Continuing to lead the Producer of the Year portion is Ryan Rispoli from HMK. Kenny Serfass from Miers Insurance stays ahead of Ryan Amey also from Miers Insurance for the second and third spots. Jess McMullen of PDM remains ahead of Paul Sheaffer of the Paul I. Sheaffer Agency for the first place, and second places in the Diversification category, with Tim Gingrich of Hutchison moving into third. Zinn stays in the lead with Christian-Baker remaining ahead of American Insurance Administrators for the second and third spots in the Personal Agency of the Year race. Felicia Clemons, Farm and Ranch Underwriter for State Auto, traveled to The Insurance Alliance Network Home Office to meet with a group of Alliance producers to discuss their products, the PennAg Prime program, and furthering the relationship. Lots of great information exchanged. Thanks for coming, Felicia! Congratulations to Chris Birkhead of HMK for being the September Producer of the Month in our Accelerations Sales Contest! Two other HMK producers also had a great month as Alan Goodrich and Walley Gonzalez came in second and third respectively. Continuing to lead the Producer of the Year portion is Ryan Rispoli from HMK. Kenny Serfass from Miers Insurance moves ahead of Ryan Amey, also from Miers Insurance, for the second and third spots. Kenny Serfass from Miers Insurance also remains in first place with Jamie Myers of Christian-Baker in second and Peter Stoll, III of the Stoll Agency moves into third. Jess McMullen of PDM remains ahead of Paul Sheaffer of the Paul I. Sheaffer Agency for the first place and second places with Wally Gonzalez of HMK remaining in third. In the Commercial Lines Agency of the Year race, Miers Insurance continues to stay in the number one spot ahead of the Paul I. Sheaffer Agency, who remains in second, and HMK moves into third. Zinn Insurance stays in the lead with Christian-Baker moving ahead of American Insurance Administrators for the second and third spots in the Personal Lines Agency of the Year category. 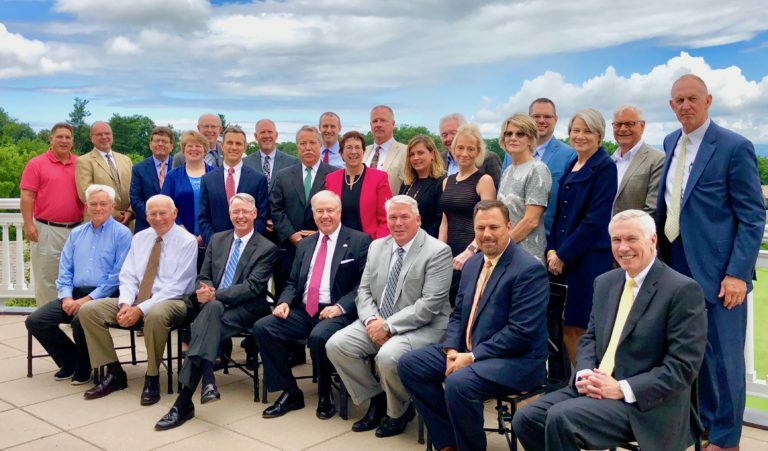 The Executive Summit 2018 was the official transition from our previous identity to The Insurance Alliance Network, and was attended by invited senior management representatives from twenty-eight of our carrier partners, members of all Alliance agencies, and the President and Chief Legal Counsel from The Alera Group. The presentation focused on “Re-Imagining The Future”, and The Insurance Alliance Network’s evolution and expansion plans. Thanks to all who attended! More photos from the event can be seen in the Flickr photo album. HMK Insurance is pleased to announce that effective July 1, 2018 Tim Kurtz has assumed the role as President/CEO. Tim has been with HMK for 22 years and has been a part of the management team for 20 years. He has been the Managing Partner of HMK since the Alera inception. Part of Tim’s new duties going forward will be greater involvement with the Alliance in leadership positions on its Executive Committee and Board of Directors. Tim will continue to handle his book of business, produce new business and help manage the agency’s growth and internal operations as he had been doing. Bill Kreitz, who preceded Tim as President and CEO, will remain on the management team and continue handling all of his accounts. This transition has been planned for quite some time and has been taking place behind the scenes for several years, allowing for a smooth and seamless change in leadership. In making this orderly transition we are confident and excited about the future of HMK under Tim’s leadership. Please join us in congratulating Tim on his new role at HMK. We are pleased to announce that The Alera Group now has majority ownership of The Insurance Alliance, effective June 30, 2018. The Alera Group has corporate offices in Chicago, Illinois, and has member firms and locations throughout the United States, including three Alliance agencies, AIA American Insurance Administrators, LLC, Hampson-Mowrer Agency, LLC, and Zinn Insurance, LLC. All other Alliance agencies will remain independently-owned, and will remain members of The Alliance. The Alliance office and management team will remain in place, with no contemplated changes in day-to-day operations, with the exception of an expanded geographic territory. We are excited about the new opportunities this presents, including the ability to recruit quality independently-owned agencies, and being in the position to become part of The Alera Group’s national P&C platform. Miers Insurance Agency has announced that Brian R. Hersh has joined the firm. Brian started his insurance career at Federated Insurance over 10 years ago and has had tremendous success in the sales of commercial lines, benefits and life insurance. Brian’s passion for the business and knowledge of insurance will be an asset to Miers Insurance for years to come. Brian joins Miers as an Account Executive to continue Miers’ recent success providing insurance and risk management services to many of the top companies in the Lehigh Valley and surrounding areas. He can be contacted 610-797-7900, extension. 3008.